A soldering iron is composed of a heated metal tip and an insulated handle. Heating is often achieved electrically, by passing an electric current (supplied through an electrical cord or battery cables) through a resistive heating element. Cordless irons can be heated by combustion of gas stored in a small tank, often using a catalytic heater rather than a flame. Simple irons less commonly used today than in the past were simply a large copper bit on a handle, heated in a flame. For electrical and electronics work, a low-power iron, a power rating between 15 and 35 watts, is used. Higher ratings are available, but do not run at higher temperature; instead there is more heat available for making soldered connections to things with large thermal capacity, for example, a metal chassis. Some irons are temperature-controlled, running at a fixed temperature in the same way as a soldering station, with higher power available for joints with large heat capacity. Simple irons run at an uncontrolled temperature determined by thermal equilibrium; when heating something large their temperature drops a little, possibly too much to melt solder. Small irons heated by a battery, or by combustion of a gas such as butane in a small self-contained tank, can be used when electricity is unavailable or cordless operation is required. The operating temperature of these irons is not regulated directly; gas irons may change power by adjusting gas flow. Gas-powered irons may have interchangeable tips including different size soldering tips, hot knife for cutting plastics, miniature blow-torch with a hot flame, and small hot air blower for such applications as shrinking heat shrink tubing. A variety of means are used to control temperature. The simplest of these is a variable power control, much like a light dimmer, which changes the equilibrium temperature of the iron without automatically measuring or regulating the temperature. Another type of system uses a thermostat, often inside the iron's tip, which automatically switches power on and off to the element. A thermal sensor such as a thermocouple may be used in conjunction with circuitry to monitor the temperature of the tip and adjust power delivered to the heating element to maintain a desired temperature. In some models, the firmware for the control circuitry is free software that can be modified by the end-user. A hot knife is a form of soldering iron equipped with a double-edged blade that is situated on a heating element. These tools can reach temperatures of up to 1,000 degrees Fahrenheit (538 degrees Celsius) allowing for cuts of fabric and foam materials without worry of fraying or beading. Hot knives can be utilized in automotive, marine, and carpeting applications, as well as other industrial and personal uses. Most soldering irons for electronics have interchangeable tips, also known as bits, that vary in size and shape for different types of work. Common tip shapes include: bevel (aka "hoof", especially if featuring concavity), chisel, and conical. Pyramid tips with a triangular flat face and chisel tips with a wide flat face are useful for soldering sheet metal. Fine conical or tapered chisel tips are typically used for electronics work. Tips may be straight or have a bend. Concave or wicking tips with a chisel face with a concave well in the flat face to hold a small amount of solder are available. 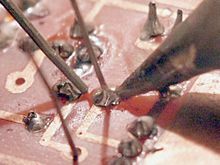 Tip selection depends upon the type of work and access to the joint; soldering of 0.5mm pitch surface-mount ICs, for example, is quite different from soldering a through-hole connection to a large area. A concave tip well is said to help prevent bridging of closely spaced leads; different shapes are recommended to correct bridging that has occurred. Due to patent restrictions not all manufacturers offer concave tips everywhere; in particular there are restrictions in the USA. Older and very cheap irons typically use a bare copper tip, which is shaped with a file or sandpaper. This dissolves gradually into the solder, suffering pitting and erosion of the shape. Copper tips are sometimes filed when worn down. Iron-plated copper tips have become increasingly popular since the 1980s. Because iron is not readily dissolved by molten solder, the plated tip is more durable than a bare copper one, though it will eventually wear out and need replacing. This is especially important when working at the higher temperatures needed for modern lead-free solders. Solid iron and steel tips are seldom used because they store less heat, conduct it poorly, and rusting can break the heating element. Iron-plated tips may feature a layer of nickel between the copper core and the iron surface. A nickel-chrome outer plating may be used further back from the very tip, as solder does not stick well to this material: this avoids solder wetting parts of the tip where it would be unwanted. Some tips have a heater and a thermocouple-based temperature sensor embedded to facilitate a more precise temperature control (TS100 and T12, for instance). A wet small sponge, often supplied with soldering equipment, can be used to wipe the tip. For lead-free solder a slightly more aggressive cleaning, with brass shavings, can be used. Soldering flux will help to remove oxide; the more active the flux the better the cleaning, although acidic flux used on circuit boards that is not carefully cleaned off will cause corrosion. A tip which is cleaned but not retinned is susceptible to oxidation. Soldering iron tips are made of a copper core plated with iron. The copper is used for heat transfer and the iron plating is used for durability. Copper is very easily corroded, eating away the tip, particularly in lead-free work; iron is not. Cleaning tips requires the removal of oxide without damaging the iron plating and exposing the copper to rapid corrosion. The use of solder already containing a small amount of copper can slow corrosion of copper tips. In cases of severe oxidation not removable by gentler methods, abrasion with something hard enough to remove oxide but not so hard as to scratch the iron plating can be used. A brass wire scourer, brush, or wheel on a bench grinder, can be used with care. Sandpaper and other tools may be used but are likely to damage the plating. Not all soldering irons are ESD-safe. Although some manufacturers' mains-powered models are built with the element shaft (and hence the tip) electrically connected to ground via the iron's mains lead, other models' tips may float at arbitrary voltages unless an additional grounding wire is used. ^ a b c Winstanley, Alan, The Basic Soldering Guide, archived from the original on 2010-04-14, retrieved 2010-04-14. ^ "What is the TS100 Soldering Iron?". ^ a b "Review: TS100 Soldering Iron". 24 July 2017. ^ "Tetris on a Soldering Iron". 7 July 2017. ^ "Play the Tiniest Version of 'Tetris' on a Soldering Iron". 7 July 2017. ^ "Thermaltronics Soldering: Products > TMT-9000S Soldering and Rework Station". Thermaltronics.com. Retrieved 27 August 2018. ^ "What is a Hot Knife? - MM Newman Corporate". MM Newman Corporation. Retrieved 2016-01-14. ^ a b c "Soldering Tips" (PDF). Userwww.sfsu.edu. Retrieved 27 August 2018. ^ "Uses of Different Soldering Iron Tips". Instructables.com. Retrieved 27 August 2018. ^ a b c "Understanding Different Soldering Iron Tips - Make:". Makezine.com. Retrieved 27 August 2018. ^ a b c "How to Solder: Through-Hole Soldering". Learn.sparkfun.com. Retrieved 27 August 2018. ^ "Hakko FX-888 Tips - Page 1". Eevblog.com. Retrieved 27 August 2018. ^ "Soldering Tip Series 832". Ersa.com. Retrieved 27 August 2018. ^ a b "HAKKO - Select Tip Shape - Drag soldering". Hakko.com. Retrieved 27 August 2018.